Common variable immunodeficiency (CVID) is one of the most prevalent primary immunodeficiency diseases. It is a heterogeneous group of immunological disorders of unknown etiology, characterized by impaired antibody responses, with recurrent bacterial, protozoal, and rarely viral infections. Severe and recurrent infections with herpes simplex and zoster are known in CVID. Enteroviral infections with a chronic meningoencephalitis-like illness in CVID have been reported. Herpes simplex encephalitis (HSE) in a more fulminant form has been reported to involve the brainstem in drug-induced immunosuppressed states and human immunodeficiency virus infections. We report a case of CVID complicated by HSE, which to the best of our knowledge has not been reported previously. An eighteen-year-old male patient presented to Emergency with a headache, fever, multiple episodes of complex partial seizures, and alteration in sensorium, since six days. Past history was significant for recurrent chest infections and diarrhea for the last five years. He was taking phenytoin and phenobarbitone for four years, for generalized tonic-clonic seizures. There was a recurrence of seizures, five months back, when an attempt was made to stop the antiepileptics. He had generalized weakness, anorexia, and a weight loss of 10 kg in the last 10 months. The history was not significant for any high risk sexual behavior or drug abuse. On examination he had generalized muscle wasting, with clubbing and generalized lymphadenopathy. He was in altered sensorium, with a Glasgow Coma Scale of six. The pupils were normal. There were signs of meningeal irritation without focal motor deficit. The rest of the systemic examination was normal. The patient was investigated for acute febrile encephalopathy. In view of the past history of recurrent chest infection and diarrhea, the possibility of chronic malabsorbtion and a state of immunodeficiency was considered. The cerebrospinal fluid (CSF) examination revealed 400 cells with 90% lymphocytes. The total CSF protein was 162 mg% and glucose was 60% of the total serum glucose. The antibody titres for HSV were elevated in the CSF. The cranial MRI revealed T1 flair and T2 weighted hyperintensities in the bilateral temporal lobes, more on the left side than on the right [Figure 1]. Electroencephalography (EEG) revealed periodic lateralized epileptiform discharges (PLEDS). HSV-2 encephalitis was confirmed by a polymerase chain reaction (PCR) study in CSF. Laboratory examination revealed hemoglobin: 9.4 g/dL, hematocrit: 31.0%, WBC: 12700/mL, with 70% neutrophils, and platelets: 2 lakhs 42 thousand/mL. The general blood picture was microcytic and hypochromic. The total creatine kinase was 587 U/L. The hepatorenal functions were normal. Immunoglobulin A levels were < 24.8 mg/dL, IgM level < 18.1 mg/dl, and IgG 430.3 mg/dl. The erythrocyte sedimentation rate (ESR) was 44 mm/hour. Low serum albumin, alpha-1 globulin, alpha-2 globulin, beta globulin, and gamma globulin levels were detected with protein electrophoresis. Flow cytometry revealed CD3: 60% and CD19: 7%. The CD4 / CD8 ratio was 0.23. Bone marrow aspiration was normal. Fine needle aspiration cytology from the cervical lymph node was suggestive of reactive hyperplasia. Endoscopic duodenal mucosal biopsy revealed partial villous atrophy with lymphoid hyperplasia. Microscopy of the sputum smear was negative for Acid Fast bacilli (AFB). The stool routine microscopy was negative for parasites, ova, cysts, and occult blood. He had no autoantibodies. The patient was seronegative for HbsAg, HCV, HIV-1, and HIV-2. In view of the recurrent infections, negative serology for HIV, and his age, CIVD was the first possibility, which was confirmed with panhypogammaglobulinemia, abnormal number of CD 3, and CD 19 cells along with reversal of the CD4 / CD8 ratio, which has been described in the CVID. The diagnosis of CVID presenting with HSE was established. He improved after acyclovir and antiepileptics, without any residual deficits. He is on regular monthly intravenous immunoglobulin (IV Ig) infusion, without recurrence of any infectious episodes. He continues to be seizure-free on regular antiepileptics. Common variable immunodeficiency (CVID) is the most prevalent primary immunodeficiency, predominantly affecting adults and is characterized by deficient antibody production. Several factors could explain the hypogammaglobulinemia present in this syndrome - (a) primary B cell alterations, (b) numerical and functional T cell abnormalities, and (c) defects in the interaction between monocytes and dendritic cells (Antigen presenting cells). The clinical manifestations of these patients is variable; most present with recurrent bacterial infections, due to encapsulated bacteria, few patients can present with mycobacterial or fungal infections, and occasionally pneumocystis carinii. In CVID, central nervous system involvement related to virus infections is an important, rare, and usually fatal complication, occurring in the later phase of the disease. Clinical features of septicemia and central nervous system infections are less frequent, however, encephalopathy has been described. 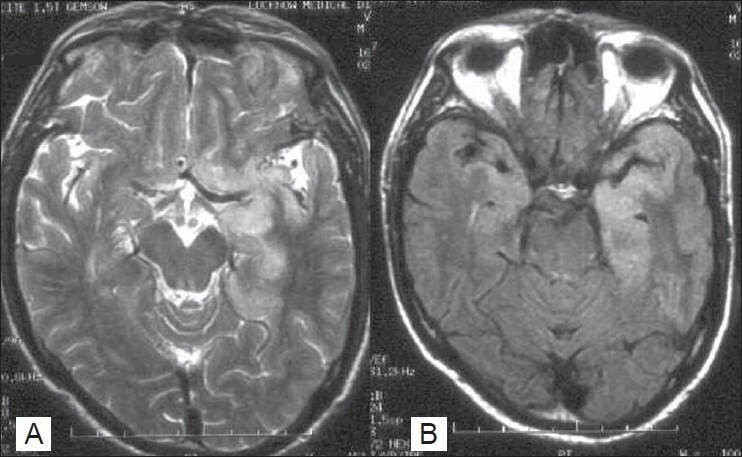 The current patient presented with herpes encephalitis. He was on phenytoin for the last four years, which was known to produce reversible hypogammaglobulinemia and was even implicated as the triggering factor in genetically susceptible individuals. The possibility of phenytoin-induced hypogammaglobulinemia was excluded when it was replaced by another antiepileptic (carbamazepine), and the immunoglobulin levels continued to be low when re-estimated after four months. The HSE in primary immunodeficiency states and related disorders have been infrequently reported. However, its occurrence in CVID per se has not been reported. Viral infections are uncommon in it, as the cellular immunity remains normal. Few of the viral infections associated with CVID mainly constitute herpes simplex and zoster infections, recurrent enteroviral skin infections, chronic colitis, and chronic enterovirus infectious meningoencephalitis. Although HSE is not regarded as an opportunistic infection, its occurrence in immunocompromised patients has been documented and is characterized by the unusual clinical and neuropathological features in this population. ,, Infections of the central nervous system by Herpes simplex viruses (types 1 and 2) are relatively uncommon in the acquired immune deficiency syndrome and are often clinically and pathologically atypical. This is probably the first described case of HSE in CVID, which highlights that in addition to bacterial infections and chronic enterovirus infectious meningoencephalitis it may also be associated with acute viral encephalitis, as is evident in this case. It is important to be aware of such an association, as the outcome is rewarding in both CVID and HSE. 1. Jha S, Jose M, Kumar V. Herpes simplex encephalitis: some interesting presentations. Neurol India 2003;51:399-400. 2. Bloch-Michel C, Viallard JF, Blanco P, Liferman F, Neau D, Moreau JF, et al. Common variable immunodeficiency: 17 observations in the adult. Rev Med Interne 2003;24:640-50. 3. Vella FS, Simone B, Carella A, Schiraldi O, Antonaci S.Acute disseminated encephalomyelitis as initial clinical manifestation of common variable immunodeficiency. A case report. Recenti Prog Med 2000;91:365-7. 4. Rudge P, Webster AD, Revesz T, Warner T, Espanol T, Cunningham-Rundles C, et al. Encephalomyelitis in primary hypogammaglobulinemia. Brain 1996;119:1-15. 5. Pereira LF, Sanchez JF. Reversible panhypogammaglobulinemia associated with phenytoin treatment. Scand J Infect Dis 2002;34:785-7. 6. Ito T, Tokura Y, Moriwaki S, Yasuda K, Ohnishi A, Furukawa F, et al. Rothmund-Thomson syndrome with herpes encephalitis. Eur J Dermatol 1999;9:354-6. 7. Le Cleach L, Benchikhi H, Liedman D, Boumsel L, Wolkenstein P, Revuz J. Hand-foot-mouth syndrome recurring during common variable deficiency. Ann Dermatol Venereol 1999;126:251-3. 8. Kumaravelu S, Duraiswamy R, Kalghatgi AT, Dhand VP. Atypical presentation of herpes simplex encephalitis in acquired immune deficiency syndrome. J Assoc Physicians India 1998;46:316-7. 9. Schiff D, Rosenblum MK. Herpes simplex encephalitis (HSE) and the immunocompromised: a clinical and autopsy study of HSE in the settings of cancer and human immunodeficiency virus-type 1 infection. Hum Pathol 1998;29:215-22. 10. Hamilton RL, Achim C, Grafe MR, Fremont JC, Miners D, Wiley CA. Herpes simplex virus brainstem encephalitis in an AIDS patient. Clin Neuropathol 1995;14:45-50.